We loved Alicia Keys in Boxing Kitten on the set of “Put it in a Love Song,” but never has she looked more elegant and refined than on the March cover of Gotham Magazine. Our beloved celebrity stylist, June Ambrose, dressed Ms. Keys in a green Catherine Malandrino dress with plunging neckline and gold jewelry. Stunning! With subtle makeup and her hair pulled back off of her face, Ms. Keys is the picture of radiant beauty. What do you think of Alicia’s new look? 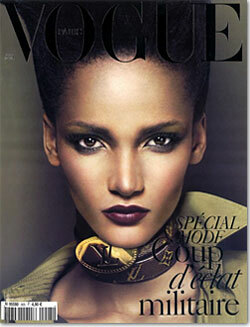 We’re also proud to hear that French Vogue, the magazine that shot Lara Stone in Blackface, has turned over a new leaf. The cover of their March issue features a solo black model, 18-year-old Rose Cordero. Shot by Mert Alas and Marcus Piggott, Cordero is the first black model to appear on French Vogue alone since Liya Kebede in 2002. Sadly, since Cordero is from the Dominican Republic, many are claiming her features aren’t “black enough,” which I personally feel is ludicrous. Do you agree? Sidenote: rumor also has it that American Vogue will feature a model on the cover of its April issue. Are we seeing a (much-needed) shift in magazine covers from celebrities back to models (Please, Fashion Gods)? Is that a change you’d like to see? Discuss.